South African prosecutors said today they would push for a longer sentence for Paralympian Oscar Pistorius, who was jailed for six years earlier this month for murdering his girlfriend Reeva Steenkamp. The blade runner shot his girlfriend dead with a shotgun in their apartment on Valentine's Day back in 2013. 'The sentence of six years imprisonment, in all the circumstances, is disproportionate to the crime of murder committed (and) shockingly too lenient,' the National Prosecuting Authority said in a strongly worded statement. 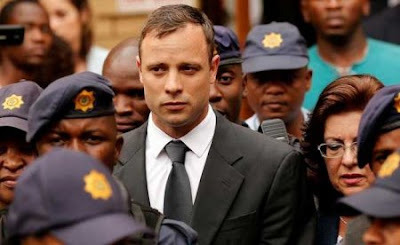 Pistorius, 29, began his sentence at the start of the month after he had his conviction of manslaughter was last year upgraded to murder for shooting dead his girlfriend Reeva Steenkamp three years ago. His lawyers said he won't appeal the sentence, which is just one year longer than his earlier jail term.